During the last several years, a constant barrage of events and forces have been challenging our thinking and pushing us to reflect on the role of racism, power, and privilege in our society. Many of us recognize that racism is deeply ingrained in our social fabric and embedded in our political and institutional policies and practices. What role can we as evaluators play in supporting efforts to truly dismantle systemic and cultural racism? What might we need to learn, or un-learn, to advance this work? Southern California Grantmakers (SCG) serves as the convener of this multi-year effort that brings together a diverse cross-sector of partners from the arts and entertainment industry, business, community and faith-based organizations, civic leadership, government, labor, media, philanthropy, schools, and youth organizations. The partnership seeks to build momentum and create a solid foundation to: (1) shift individual mindsets, behaviors, and actions about racial equity, (2) change systems and organizational practices, behaviors, and policies that perpetuate racial bias, and (3) change narratives to dismantle beliefs in racial hierarchy. Our collaboration with TRHT-LA has been an extraordinary opportunity to reflect on how we support learning and evaluation focused on racial inequity. In this blog we share some of our emerging reflections and how we’re attempting to adjust our thinking and approach. We hope these reflections contribute to ongoing dialogue in our field about ways to keep equity at the center of learning and evaluation. We have to be willing to adjust our roles in advancing equity, even when it makes us uncomfortable. This means unlearning our traditional roles as evaluators and being fluid and responsive to what’s needed as the work unfolds and evolves. For TRHT-LA, we have at times served as facilitators, sense-makers, and story-tellers. At other times, we have been active co-learners, allies, and fellow participants, listening to and sharing our own personal stories and experiences with racial inequity. For example, members of our team joined hundreds of professionals from the nonprofit, philanthropic, business and government sectors in trainings on the “Hidden Bias of Good People” by Dr. Bryant T. Marks. Our own participation in these trainings reminded us that we are not neutral arbiters in this work. Implicit bias shapes our beliefs and how we view and interact with the world. It shows up – often unconsciously - in the questions we ask, the assumptions we make, and the conclusions we draw. We have many blind spots, but we’ve found that our willingness to address these blind spots and embed ourselves as co-participants in the work helps us better understand, empathize, and lift-up diverse voices and perspectives. Listening is the ultimate act of respect. Through our work, we’ve also had the opportunity to participate in racial healing circles, in which individuals come together to share their truths, history, and stories. It’s been an illuminating experience and we continue to reflect on how deep listening can strengthen our evaluative practice and contributions to racial equity outcomes. Recently, we set out to gather insights from a cohort of over 40 people as they culminated a six-month training to become racial healing practitioners. We realized traditional focus groups might feel out of sync with the deeply powerful and personal experience of participants. We needed to rethink our approach and identify new, creative ways of listening that support rather than interfere with the training activities. 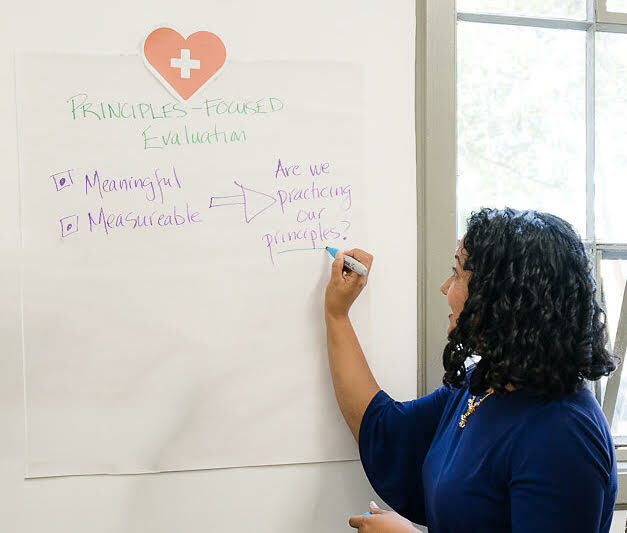 We collaborated with the training organization California Conference for Equity and Justice (CCEJ) to co-design a respectful way to build on existing feedback loops and honor the experience of participants in an inclusive way. We joined their graduation ceremony and hosted listening circles which focused on three core questions about their experience. We also created a dream and commitment wall using large post-its where participants shared their aspirations for racial equity along with their individual commitments to advance racial healing conversations in their workplace, communities, and social life. Creating space to reflect, process and build collective capacity for dialogue. We recognize that racial equity initiatives can feel messy and more emotionally charged relative to working in other spaces. As evaluators, we need to engage in challenging discussions about the ways our personal biases, values, power, and privilege influence our work and be self-reflective about how we can continuously improve ourselves and our practice. This is inherently disruptive, personal and transformational work. How can we effectively manage our own emotions while also honoring the emotional burden others carry? Despite the urgency to undo centuries of injustice, we have to go slow to go fast. We must spend time questioning traditional White-dominant ideas of methodological rigor, let go of our deadline-driven mentality, and set aside time to listen, learn, unlearn and process what we’re experiencing. One thing we have found useful is holding intense period debriefs and periodic reflection sessions with clients and stakeholders. We also are finding great value in deep conversations with our internal team and other peers doing racial equity work. Ultimately, we believe this helps build our collective capacity for crucial conversations and constructive dialogue that advance racial equity. Finally, we are reflecting on the power of art to connect, communicate and heal. TRHT-LA hosts a diverse range of educational and artistic events throughout the year to strengthen the ties that bind us together on this journey. It seems only fitting that we explore creative ways to collect and share evaluative information that advance equity and inclusion. Can evaluation, like art, also be a tool for healing? If so, what would that look like? Our work in Los Angeles – one of the most racially, culturally, and ethnically diverse regions of the country – provides a truly unique laboratory for testing and learning. We are grateful to have the opportunity to be learning alongside our TRHT partners and other evaluators who are grappling with these challenges and exploring new approaches. We look forward to sharing more about our journey and are eager to hear about yours!